NORBLACK NORWHITE is handcrafted, high quality and knows how to party with ROYGBIV. Created by Mriga Kapadiya and Amrit Kumar, the vibrant brand honors tradition while progressing humankind through awareness. 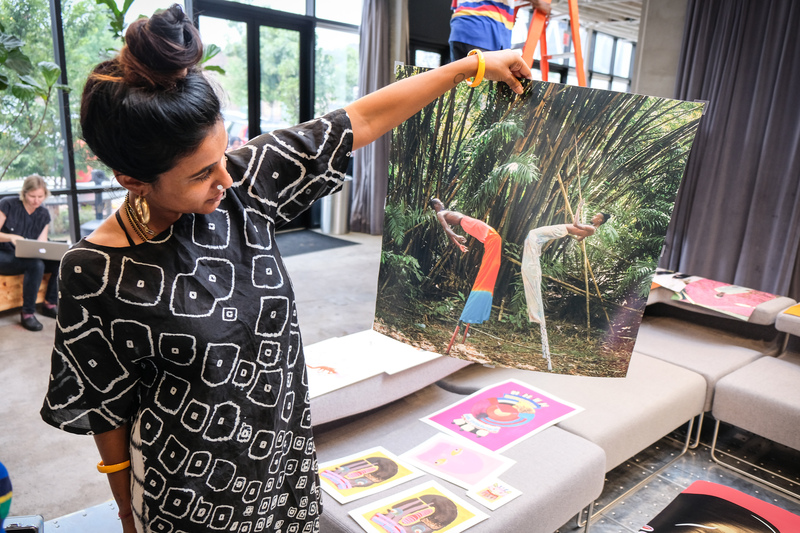 Learn why and how they do it (without dropping one dime on ad spend) in our interview below, held at their recent pop-up in BKLYN’s A/D/O space. Q: Okay so you were raised in Toronto. How did you two initially meet and go from friends to business partners? Mriga: We grew up in different suburbs around Toronto and when we moved downtown after college there weren’t that many brown creatives. A lot of the brown people that lived in the city were working in the financial district and corporate areas of the city and we didn’t get to see too many of them. Then when we were on the come-up there were only a few brown people in the creative space, we all just kind of found each other. Amrit and I met a little bit beforehand through mutual friends chilling. Then when we came into the city and kind of started finding a voice. Amrit used to work at this vintage store in Toronto called 69 Vintage and I used to throw events and festivals with my now partner, and used to throw them in the vintage store itself. Amrit and I would do impromptu photoshoots and in our friends’ backyard and it was very very casual but that’s when we started having the design and aesthetic relationship, and we became really good friends. We admire each other’s style and usage of some of our Indian textiles incorporated with what we wear on the daily. There’s a lot of people doing stuff like that – the way that we did it was similar so we had a mutual respect for each other. Q: So what was the catalyst that caused you two to pack your bags and head to India? Q: Can you talk a little bit about some of the disappearing art forms you learned about and your approach to help preserve them? 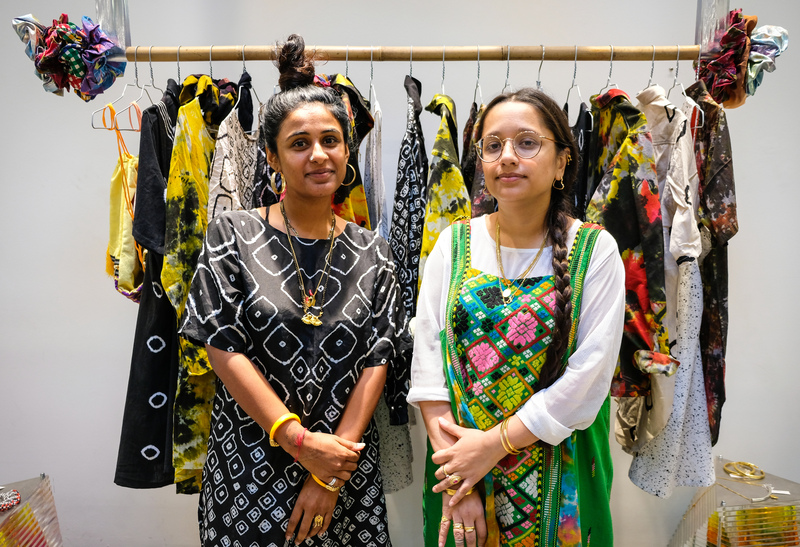 Mriga: Within a year we decided on a trip when we were traveling through Kutch, Gujarat in India to visit these artisans who create a form of Bandhani (a form of tie-dye). I’m actually wearing it right now. This is the same family we started working with, and they still work with us. And so we met these artisans and hung out with them. We were supposed to stay for a day we ended up staying for a week and built with them. We had a little bit of cash saved up from working in Toronto so we built our first collection, we learned what a lookbook was, and shot our first collection at our friends apartment with some friends who modeled the clothes. We took it to a tradeshow that we paid for in Paris and then at that trade we got our first order. So from there it just started into a real brand. Q: Your philosophy, “develop from paying respect to the past, questioning the present and creating for the future”, how do you actualize that? Mriga: We wanted to explore a space that was a cultural space, and not just a fashion space. 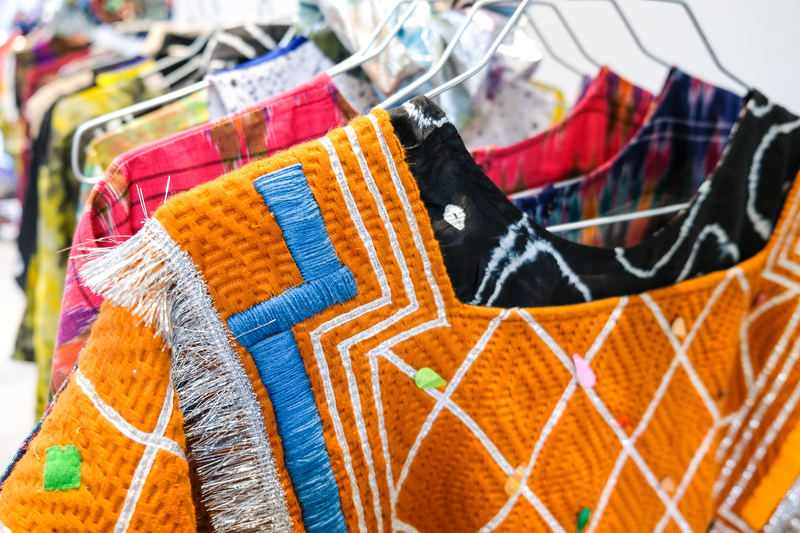 The form right now is in textile and in fashion but there’s a lot more to what we’re excited about. Representation and diversity in any sort of creative space for young girls to know that you can do things outside the quintessential corporate job, show a different way of putting together multiple cultures, and being okay of representing multiple identities, that was a big thing growing up. You know, you’re not from here and you’re not from there. That was always a grey space by being a diaspora, a community member of the diaspora. It’s like in India we’re not Indian enough. In Toronto we’re not Canadian enough so it’s like okay why are we not always enough? We are as we are. We’re important in this space by being okay with who we are and identifying with it and knowing that there’s a lot of other people that live in the same space as we do, and it’s cool. That’s a really important part of the communication of it, hence the name NORBLACK NORWHITE, it’s neither here neither there, it’s a little bit of art a little bit of fashion a little bit of anthropology and history and culture and also exploring that grey space. Q: And how do you turn your approach to ‘questioning the present’ into the tangible? Mriga: So when we say questioning the present it’s just like taking it from an infrastructure level, taking it from a cultural representation level. What’s going on right now. There’s a lot of confusion there’s a lot of influx of information being put out and how does that work, and specifically in the world that we work in fashion. 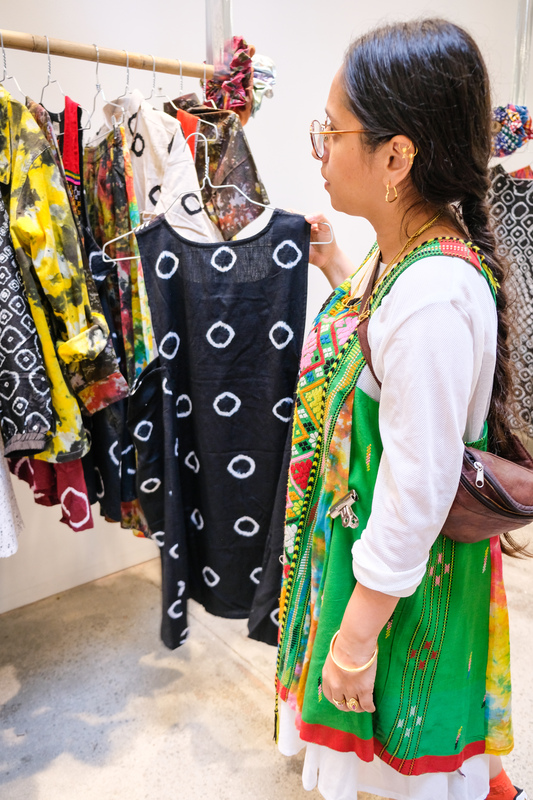 Like when we used to do trade shows in New York and Paris (we stopped doing trade shows, but when we used to do tradeshows) like we were literally the only brown people in there, let alone the only brown women in there. And even in such a multi-cultural place like New York we were one of two or three brown people in there. There was stuff being told to us like, “You should use white people in your look books because they’ll sell more, this is a lot of patterns this is a lot of colors this is too busy this is too that and it’s like what does that mean right now? It’s 2018 and when we started four years ago this is what was going on. Like what does that mean? That’s what we are questioning from the industry level, that’s what’s going into our final product. And one common misconception too is about gender. There’s a lot of men at the tradeshows. Mriga: For sure. And a lot of people who weren’t the actual designers they were representing brands because the designers are on the backend. Because we are so hands-on with our stuff we also wanted to represent our brand because it’s not just about a random person selling it. Q: About your process…you two make what you create, is that right? You don’t source your fabrics? And in terms of your retail supply chain, what barriers do you face operating? Mriga: Yes, we create the fabric. And people expect things really fast. People expect a made-in-China mentality but need to realize patience and time because our stuff is handmade and handcrafted. Buyers think it’s beautiful and amazing and then they want it in a month. It takes three months to make and it’s like, how do we create with integrity but also maintain it financially and make sure that people are getting what they want? So there’s a lot that goes into it and we lose a lot of sales because of it. Q: I could see that being a big a challenge, how do you circumvent it? Mriga: Yea we’re just trying to focus on the people that actually just love our stuff and can buy it. So that’s what we’ve been building on. It’s been a big challenge financially and business-wise but it’s like that’s kind of the story. It’s always a struggle still. We’re just trying to focus, there’s enough people out there still that should be able to afford and buy it, it’s just about reaching them. And we do it strictly through community and if someone really believes in it they tell another person, it’s a word-of-mouth based thing right now, everything we’ve done has been organic, we’ve never paid a dollar for PR or marketing. Everything we’ve photographed is either ourselves or community members we shoot on ourselves and friends we don’t hire models like that, everything is kind of grassroots until this day. It’s been a slow process, but it’s been an integrous process. Q: Super-fan of your “A woman was harassed here” project with Aqui Thami. Can you share your experience with the project? Mriga: It’s been interesting because putting it out there we got a lot of feedback that it was too aggressive which is funny because that’s what it’s supposed to be. Q: Who thought it was too aggressive? Mriga: Just young people in India too, like everywhere. We just got some of that as feedback. Some people got too scared to wear that shirt, which is real. So it’s kind of taking that slow and trying to figure out how to best apply that next. But we think it’s a very important statement to make right now and deal with it through our own work where we’re constantly being harassed on all levels. From our lipstick to the train. I took it as a big statement of solidarity. Q: Pausing on your colorful style with popping accessories, if you could raid one 90’s hip-hop, RnB or rappers’ closet – sneakers included – who’d it be? Q: Frida Gianinni is on the record for complimenting your color choices and treatments. What do you think you understand that other designers don’t? Why do you think she focused on that to compliment you? Mriga and Amrit: Um, well it’s funny because both of us aren’t trained in fashion. We didn’t go to school for fashion, we never learned the technical aspects, it’s straight intuition so that’s a compliment to our eye and our intuition I think. We love the use of color. Generally, not just in clothing, but in any sort of form. It was nice that someone had seen so much recognize that there was something there. Q: Why do you care about preservation of culture? Mriga and Amrit: Because what else is there if you don’t have culture? It drives and leads people’s happiness, how people operate everyday and how people pass things along. If things aren’t preserved then there’s nothing to mark where we came from. Preservation in the sense that we’re always excited about evolution in the sense that it’s evolving but it’s important to know where you come from to know where you are going. 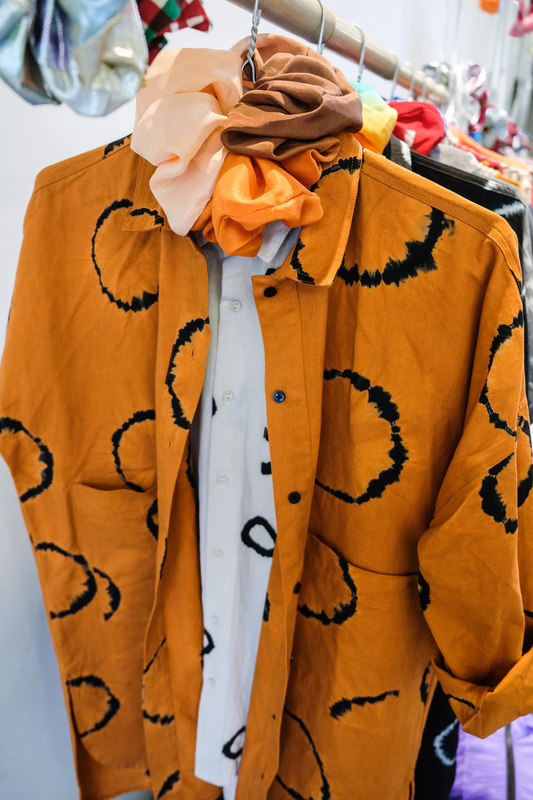 Want to fill your wardrobe with more designers like NORBLACK NORWHITE? Drop your email on the line to learn about other brands run by women, people of color and LGBTQ.